I featured Suzor-Coté a few days ago. So I am using his sketch of “The Death of Montcalm.” Montcalm was defeated by James Wolfe at the Battle of the Plains of Abraham. James Wolfe also died. He was 32 and Montcalm, 47. Yesterday, I had a conversation with an educated French Canadian. It was an eye-opener. This gentleman is convinced that the arrival in Quebec of immigrants with multicultural backgrounds will ultimately lead to the disappearance of the French milieu in Quebec. Moreover, he is certain that Nouvelle-France was conquered, which negates the choice the French made in 1763, the year the Treaty of Paris was signed. He emphasized that Britain had long wanted to add Nouvelle-France to its colonies, forgetting, for instance, that when Pierre-Esprit Radisson and his brother-in-law, Médard des Groseillers, known as “Radishes and Gooseberries,” discovered the Hudson Bay and returned to Canada with a flotilla of a hundred canoes filled with pelts, they were treated as coureurs de bois rather than explorers. 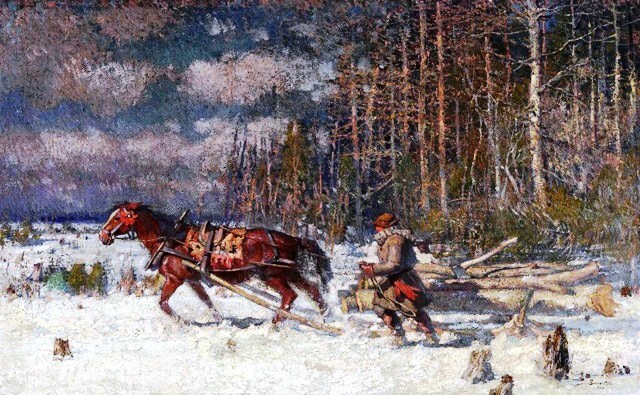 Unlike coureurs de bois, voyageurs were hired and had a license to travel and fetch fur west of what is now Quebec. Because the fur he had brought to Montreal was confiscated, Radisson went to England and obtained the support of Prince Rupert of the Rhine, KG, PC, FRS (17 December 1619 – 29 November 1682). Prince Rupert financed an expedition to the current Hudson Bay. In 1668-1669, the Nonsuch sailed across the Atlantic. Radisson was right. Large boats could travel to the inner part of Canada, from the North. This way fur traders would not need canoes as much as they had to previously. Yet, let it be known that canoes manned by nimble voyageurs continued to do the better job of gathering precious pelts. 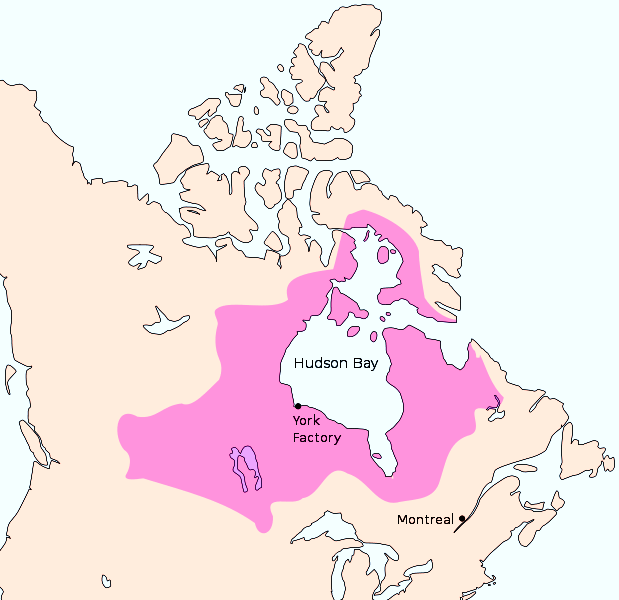 The fact remains, however, that when the Hudson’s Bay Company was founded, in 1670, Britain acquired Rupert’s Land. It was a vast chunk of North America which the French had an opportunity of acquiring, except that Louis XIV was building a castle at Versailles, which French peasants would have to pay for. At the conclusion of the Seven Years’ War, France’s financial circumstances were strained. In October 1776, Louis XVI appointed Swiss-born Jacques Necker director-general of the finances, but despite a degree of success, Necker could not prevent the French Revolution. In other words, in 1673, not only had France lost battles, but it was poor. Nouvelle-France being a financial burden, France chose to keep sugar rich Martinique and Guadeloupe. Of course, Britain wanted to appropriate Nouvelle-France, i.e. Canada and Acadie, but France itself could not fight back. It seems that, in the end, the more prosperous nation won. At one point, France owned nearly two-thirds of North-America. It lost New France in 1763 and, in 1803, it sold Louisiana. Napoleon (15 August 1769 – 5 May 1821) needed money. Battles do play an important role in history but, occasionally, there is a “bottom line.” New France fell to Britain, but in this particular demise, only a richer France could have kept New France. The puzzling element in the Treaty of Paris is Britain’s willingness not to take away from its new French-speaking subjects their farms, their seigneuries and their religion. Moreover, at the time of the French Revolution, Britain made it possible for émigrés priests to move to Quebec where they would not be idle and that many became educators. 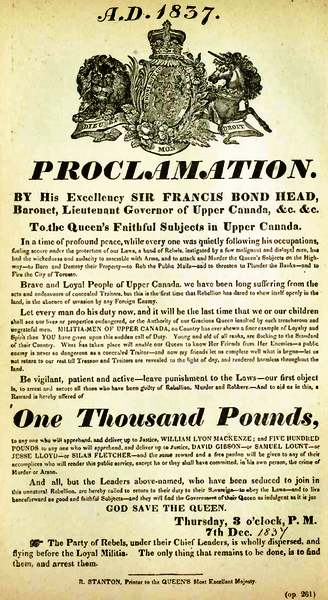 I will conclude by expressing doubts as to the possibility of teaching their true history to those Québécois who have chosen to think that New France was conquered, that there were no ‘patriots’ killed in Toronto (see Upper Canada Rebellion), and that Canada is not an officially bilingual country promoting the use of French. I would also like to stress that if French-speaking Quebecers want to keep their language, they should make it their personal duty to do so. Speaking French as well as possible begins at home. As for the Quebec Government, it would be my opinion that, with respect to the survival and growth of French, it ought to make it its main mission to encourage Québécois to speak and write their language more correctly. It would give itself a positive and attainable goal. Québécois should feel motivated to perfect their French. At any rate, there was no “conquest” of New France. France had lost battles, but the truth remains that it chose to part with New France because it was not bringing in a profit. 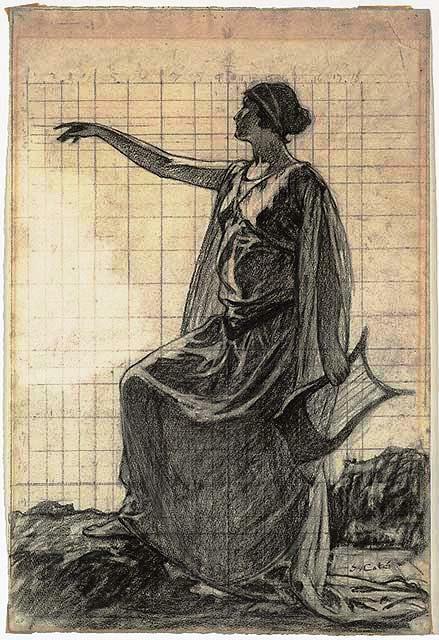 Many posts ago, I featured an artist by the name of Marc-Aurèle de Foy Suzor-Coté (April 6, 1869 – January 29, 1937). Suzor-Coté was a friend of my grandfather’s family in Arthabaska, now Victoriaville, Quebec. 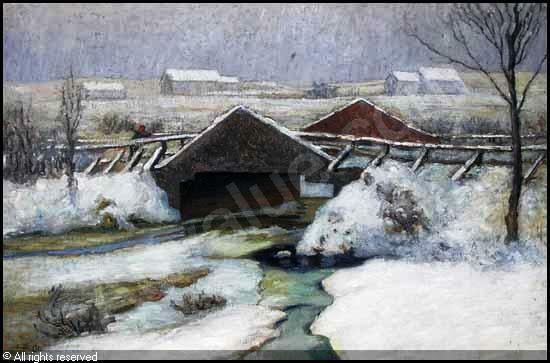 I posted a painting of Suzor-Coté’s Pont Bourbeau, painting showing a bridge on my grandfather’s family farm. I may also have shown the Rivière Bourbeau. In short, the Bourbeaus were friends of Suzor-Coté and, in all likelyhood, my grandfather met my grandmother at the home of Suzor-Coté. My grandmother was an artist who worked as an assistant to a well-known artist. The artist had to be Suzor-Coté. Moreover, she treasured a certain painting she had placed above a large couch. Many posts ago, I also wrote about French-Canadians in the United States, and that post was read by a WordPress author Jon Verville. The Vervilles and the Bourbeaus are relatives. Verville is a Bourbeau name. Jon is a descendant of Élie Bourbeau who is also my ancestor. I thought Pierre and Simon were the only Bourbeaus to come to North-America, but my sister tells me there was a third Bourbeau named Élie. So one of the benefits of blogging is that one may meet a fine relative. The Bourbeaus were Huguenots, French Calvinist protestants. On 13 April 1598, during the reign of Henri IV, king of France and Navarre, an edict of tolerance was promulgated: the Edict of Nantes. Under the terms of the Edict of Nantes, certain cities became a safe haven for Huguenots. However, the Siege of La Rochelle (1627-1628) proved that tolerance could not last. After the assassination of Henri IV (13 December 1553 – 14 May 1610), a former Huguenot, France was ruled by Cardinal Richelieu, the main architect of absolute monarchy. 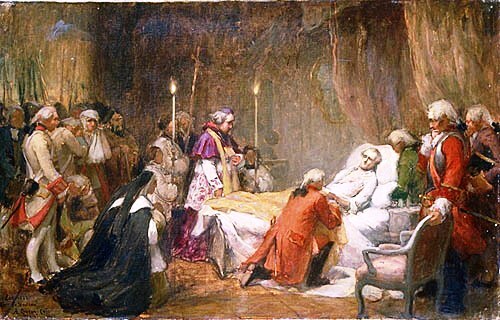 It was the Cardinal’s conviction that the French were to have one religion, one language, and one king. Given such a programme, the Huguenots had to be eliminated. The Siege of La Rochelle was indeed a ruthless resurgence of hostility towards Huguenots. It was led by a pitiless Richelieu and lasted one year. At La Rochelle, approximately twenty thousand Huguenots died of starvation, but some five thousand survived, including at least one Bourbeau. He fled to the Anglo-Norman Islands and then left for New France. Many Huguenots had sought refuge in Nouvelle-France where several were merchants rather than farmers. Most Bourbeaus of Nouvelle-France left for the United States when the Edict of Nantes was revoked, in 1685. Huguenots played a significant role in the founding of New France. Both Pierre Du Gua de Monts (c. 1564 – 1628), the founder of Acadie, and Samuel de Champlain (before 13 August 1574 – 25 December 1635), the founder of Canada and the official father of New France, were Huguenots. Champlain, however, concealed his religious preferences. Du Gua de Monts didn’t. Consequently, Champlain has long been considered the father of Acadie, which is not altogether the case. Champlain had travelled to Acadie with Pierre Dugua, Sieur de Monts or Pierre Du Gua de Monts, but as cartographer, rather than the organizer of an expedition. The expedition had been organized by Du Gua de Monts. 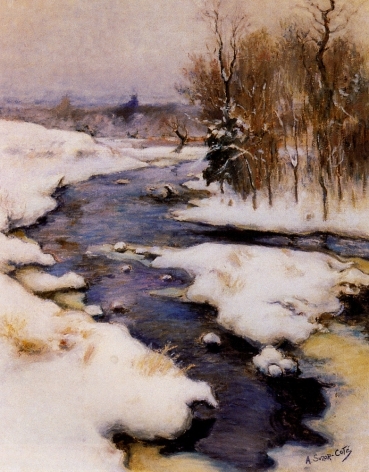 As mentioned at the beginning of this post, the Bourbeau family of Arthabaska were friends of artist Suzor-Coté who made at least two paintings of land owned by the Bourbeaus: the “River Bourbeau” (La Rivière Bourbeau) and the “Bourbeau Bridge under the Snow” (Le Pont Bourbeau sous la neige). 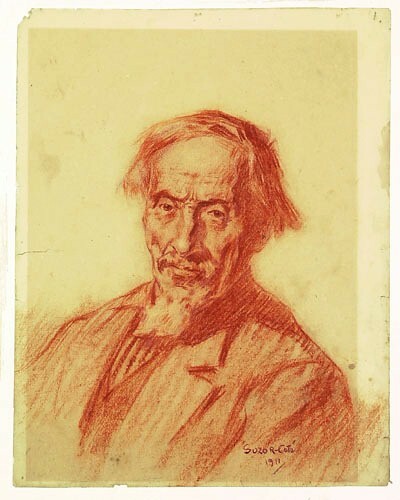 We also owe Suzor-Coté a magnificent drawing of Le Père Verville, in sanguine. I am therefore posting a few artworks by Suzor-Coté, including Le Père Verville and the above-mentioned Bourbeau paintings, to celebrate an extraordinary coincidence: meeting a relative blogging. I have lost information concerning the provenance of two of my Suzor-Coté pictures: the Bourbeau River and the Bourbeau Bridge under the Snow. The Bourbeau Bridge sold at an auction in 2007. 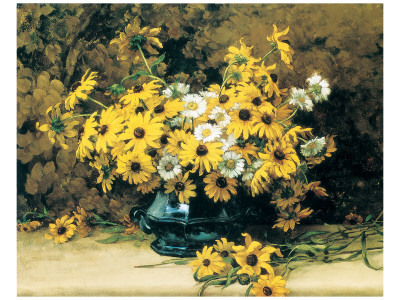 Prints of Suzor-Coté’s Still-life with Daisies are available commercially. The Galerie Walter Klinkhoff sells Suzor-Coté paintings, but many works are in private collections. This is a painting I simply love. When he made this painting, I believe Suzor-Coté was thinking about every little girl. I therefore wish to share it with you. Marc-Aurèle de Foy Suzor-Coté is a French-Canadian artist whose assistant was my grandmother. She loved the fine arts. She loved beauty. Writing the story of the indépendantistes tired me out, so today I cannot post a long blog. Yet, I feel that someone had to tell the story of the indépendantistes just so people can understand what is going on. The indépendantistes wish to have their own territory, which is understandable, but they cannot do so not at the cost of severe social unrest. We are a privileged people. By the way, I made slight corrections to my text and added links. I would like to be able to say that I am the artist who made the above painting, but it would be a lie. This is one of Suzor-Coté’s paintings. I consider it a privilege to be able to see flowers so beautifully depicted. Today was a special day in the history of the United States. Americans were made to realize, albeit inadvertently, that the person who will oppose President Obama in the November election might not have become the leader of his party by telling the truth. I knew this but, suddenly, so does every body else. one may quote elements of my blogs, provided one acknowledges one’s source. I hope the above is fairly comprehensive. Where technical issues are concerned, I am occasionally at a loss, but I think I am slowly making progress. 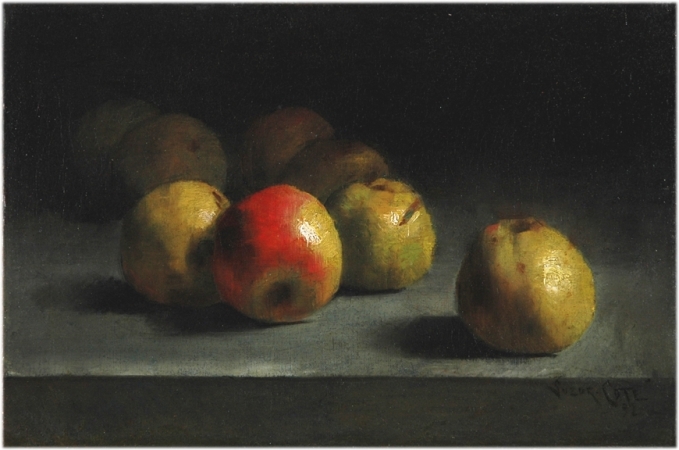 But let us focus on Suzor-Coté’s Still life with Daisies and these Apples. There are happy and unexpected moments. For instance, a few days ago, I went in search of information on my grandfather’s family. He was a Bourbeau and he is my mother’s father. I have used his name when publishing scholarly articles: Bourbeau-Walker. The Bourbeaus came to New France in the seventeenth century. They were Huguenots, or French Protestants. Two brothers came to New France: Pierre and Simon. They had survived the Siege of La Rochelle (1627-1628), by Richelieu and Louis XIII. The protestants had chosen La Rochelle as their refuge even though the Edict of Nantes (1598) protected them, at least officially, from persecution in other locations. However, it is at that point in the history of France that absolute monarchy was consolidated. After King Henri IV was assassinated, in 1610, although still in effect, the Edict of Nantes, which stipulated tolerance of Huguenots, was not always respected. Henri IV, who had converted to Catholicism, had been a Huguenot, which is why he was assassinated. His son, Louis XIII, was too young to be crowned, so a regent was chosen: Richelieu. Richelieu became the chief architect of absolute monarchy in France. It was his belief that the King’s subjects should all speak French and be Catholics: one King, one language, one religion. During the Siege of La Rochelle, some 22,000 protestants were starved to death, but two Bourbeau brothers were among the 5,000 who survived and the two later moved to New France. In 1685, when the Edict of Nantes was revoked by Louis XIV, the Bourbeaus and other French protestants living in New France moved south, to the English colonies. But a few stayed in Canada. As I was searching Bourbeau entries, I saw a picture of the Bourbeau farm and realized that it was located in the area of Quebec where my grandmother had grown up. 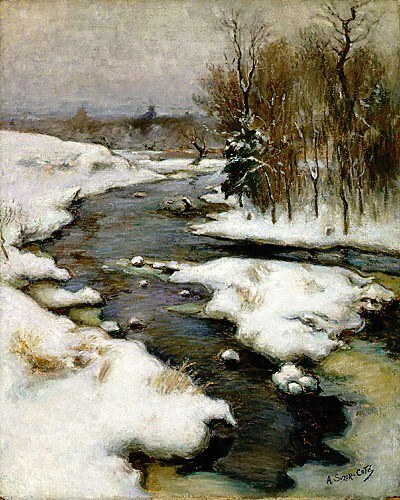 This picture, an oil painting, is the work of Marc-Aurèle de Foy Suzor-Coté (1869-1937), now famous. 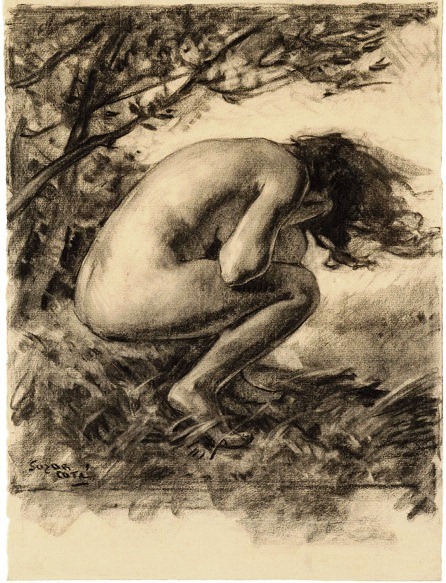 I knew that my grandmother had been an artist’s assistant, so I was able to determine for certain, first, that the artist was Suzor-Côté and, second, that in all likelihood she met her husband, a Bourbeau, because the Bourbeaus were close friends of Suzor-Côté. 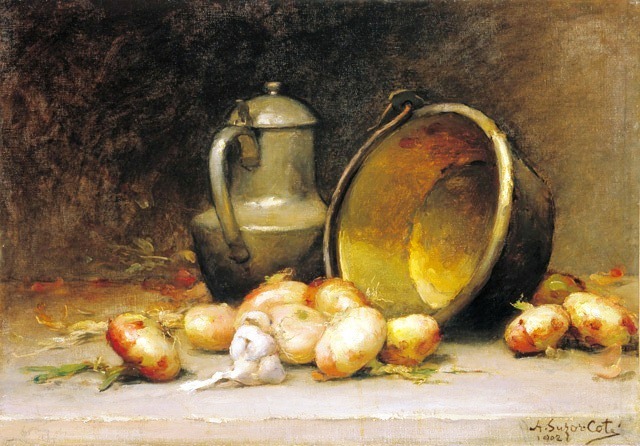 There are several Bourbeau paintings by Suzor-Côté. Research is an extremely interesting endeavour because of surprises and coincidences. I will now attempt to incorporate a least one of Suzor-Coté’s paintings in this blog.